.co.za domains - register .co.za domain names with Web4Africa for only R96! If South Africa is your target market, then we strongly suggest that you register a .co.za domain name. If you do not intend to design a customized website for South Africa, you can re-direct traffic to your (more popular?) .com/.net/.org or any other international top-level domain (TLD). Doing business with a .co.za domain shows you are serious about your South African audience/customers. Why are we mentioning Google? Google is by far the leading search engine on the WWW (Internet) today. Google has a version for South Africa. You can rank better if you use a .co.za domain name - especially when searchers restrict their search to South African websites only. Aside Google, MSN also provides an option for searching South African websites only. There are several South African search engines that index domains under the .za TLD only. Dont be left out - join the party! 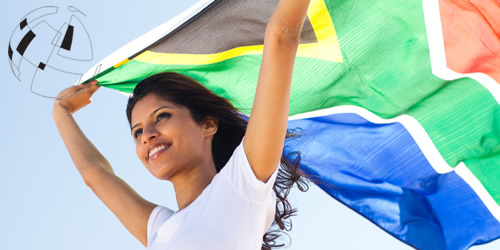 Are you proudly a South African citizen/company/organization? You should be proud to show your South African identity online too. Other countries' domains like Germany (.de), United Kingdom (.co.uk), France (.fr), Australia (.com.au) amongst many others, are very popular, because the website owners in the respective countries prefer their country's domain suffix, to .com/.net/.org, amongst other reasons. You too can help develop South Africa's Information / Communications Technology (ICT) infrastructure, by using .co.za domains. You probably already own a very valuable brand, that is widely recognized in South Africa? You already have the .com form of your domain name? You should consider registering a .co.za as well. If you are not ready to create a customized website for your South African audience, you can re-direct traffic to from your .co.za to your .com domain name. This should be the last reason why you would consider a .co.za domain name. Your business name is Web4Africa for example? web4africa.com is taken? Why bother about web4africa-something-somewhere.com? Why not simply register web4africa.co.za? This way, you maintain a short and easy to remember domain name, while still targetting a South African audience, ranking well on Google South Africa, and helping developing South Africa's ICT infrastructure. Ready to register a .co.za domain name? Click here now! Payment for windows web hosting and domain name registration services offered to residents of South Africa can be done via PerfectMoney, Payza, , Skrill, Paypal and more.